Fans of Star Wars: The Clone Wars are still celebrating the recent announcement that the series will be returning next year on Disney's direct to consumer streaming service. The reveal was made during a panel at San Diego Comic Con celebrating the 10th anniversary of the series' launch and it was met with near-universal excitement from fans. Work on the series' revival has been ongoing for several months now and the series launch is still many months away, however The Clone Wars supervising director Dave Filoni spoke with Cinemablend recently about the new challenges of bringing the beloved series back. One of the places the legacy of The Clone Wars' original run is in the new characters it introduced to the Star Wars galaxy, with the two major stand outs being Ahsoka Tano and Clone Captain Rex. Both characters' fate were left uncertain by the original run of The Clone Wars, which led to them being brought into the animated series Star Wars Rebels. 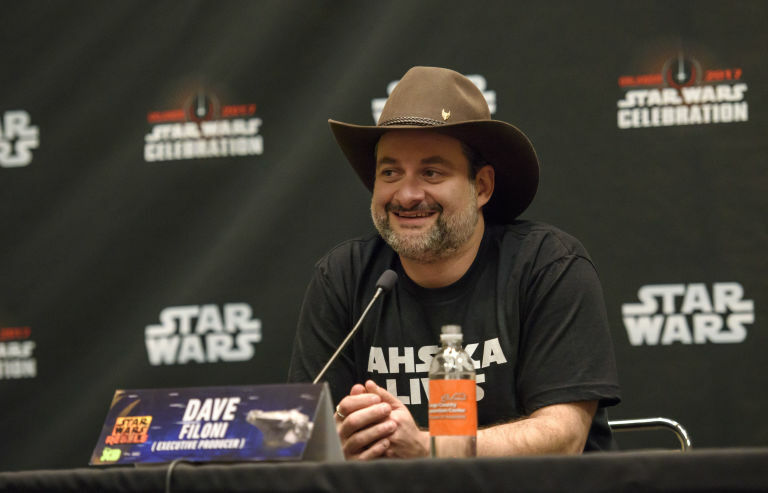 Although their ultimate fates still remain unknown, audiences and creators knowing at least some of what happens to those characters after The Clone Wars has presented Filoni with a whole new set of challenges. He elaborated about them to Cinemablend, saying. "It's interesting, because Clone Wars affects Rebels and that's progressive, but now I have to look at it in reverse and I have to look at all the things I did with Ahsoka and Rex and say 'Well, now I know these things happen so how does that affect what they were like now that I'm back in Clone Wars?' So I have to do this other time of engineering which I didn't have to do before because Ahsoka in Clone Wars is always forward-moving, and so is Rex. Their futures were undetermined, but now you know something about them, so that's different. That's new for new Clone Wars, so we'll see. Hopefully I can figure it all out." Both Ahsoka and Rex were featured prominently in the teaser trailer announcing the series' return at Comic Con, and there are already built in fan bases with huge expectations for the characters. When they were brought into Rebels, Filoni and his crew spoke about how they worked out much of what happened to them (some of which was hinted at in Rebels and in the novel Ahsoka by EK Johnston). So, they should have at least some of an idea at what needs to happen to bridge that gap successfully. And, given that there was so much crossover between the crew of Rebels and The Clone Wars, it seems very likely they will be able to pull it off.